Last Minute Specials/Pet Friendly/Very low off season rates!!! !/Best Reviews!!!! If you don't like my rates, make me an offer! Welcome to Martha's Vineyard Vacation Homes on the beautiful and historic island of Martha's Vineyard. We have four centrally air conditioned modern homes located one and one half miles from State Beach and one mile from Edgartown Harbor on a serene country dirt road. On a two acre parcel, each home is on its own half acre. We offer a small two bedroom ranch home and 3 - three bedroom contemporary homes. Each home is on a half acre lot; all on a two acre compound. We rent from Wednesday to Wednesday in July and August. Sometimes one of our homes is rented from Saturday to Saturday or Sunday to Sunday during July/August. Please check with us by email or phone. Other times you pick the days of your vacation!! Check in time is 2PM and check out time is 11 AM. All rates include utilities, local and long distance phone and free wireless internet AND all linens and towels! There are exceptions to this so please contact us to verify availability. Reasons to rent our House: 1. You will be dealing directly with the owners 100% of the time. 2. We are members of Martha's Vineyard Chamber of Commerce and The Better Business Bureau (Online BBB) with NO complaints, EVER! 3. All my homes are centrally air conditioned and heated and have ceiling fans in all the living rooms and bedrooms. 4. There is free high speed wireless internet through cable. 5. Linens and towels are provided at NO additional charge to you. The beds will be made up for you when you arrive! 6. My homes (4 on a two acre compound) are on private and quiet country roads. 7. The homes are 1.5 miles from the beach and 3/4 mile from the center of Edgartown. 9. Free long distance and local telephone within USA, Canada and PR. are provided. 10. Cable TV is included. 11. There is unlimited parking on the property including space for your boat. 12. I will personally help you get your ferry reservation for your car. 13. The property is available for weddings, and other special events. Tents can be rented. 14. All my homes have charcoal Weber BBQ grills. 15. There are TVs and DVD players in the master bedrooms and the living rooms. 16. You will be able to contact us 24/7. 17. All my homes have sand chairs for the beach. 18. We are Pet Friendly! And guaranteed clean (including the property)! 19. We will arrange for a baby crib. We will make all the arrangements for you to rent your baby crib. In both events the crib will be ready for you when you arrive. 20. Clothes washers and dryers are provided in all my homes. 21. There are dishwashers in the three bedroom homes. 22. We accept Visa, Master Card, American Express and Discover Card. 23. Our website is updated daily. 24. Our kitchens have all the kitchen utensils you will need; and if you get there and there is something you need, we will reimburse you for it...just call us first! 25. Our goal is provide such good service and amenities and VALUE that you will want to come back and send all your friends, relatives and neighbors to us.....if we cannot do that then we need to do a better job...just let us know! 26. We will help you to arrange to have bicycles available for your use when you arrive. $175 per night for 2 bedroom house Sunday night to Wednesday night. $200 per night for 2 bedroom house Thursday, Friday and Saturday nights. $200 per night for 3 bedroom house Sunday night to Wednesday night. $225 per night for 3 bedroom house Thursday, Friday and Saturday nights. All 'off season rates' are for 4 persons or less in a three bedroom home. All rates in our two bedroom home are for 4 persons or less all year round. When visiting Martha's Vineyard don't miss the light houses! About me?! I purchased two acres of property in Edgartown, MA in 1974. At the time, I had a dream of building some homes and renting them to vacationers. That dream and 'lots of hard work' has come true. The property I purchased was 'on paper' 4 one half acre lots. In other words, the 2 acre lot had already been subdivided by the seller (Linwood Belisle). I was in my mid-twenties at the time, married, working as a teacher in NYC and very little money. But, WE had a dream! More later!!! A review from one of our guests! My husband and I stayed at this beautiful 2-bedroom home for five nights around Labor Day weekend 2014 and couldn't have been more pleased with our stay. The home is exactly as pictured here, though in our opinion, has even more rustic Vineyard charm in person! It has everything you could need for a stay, from kitchen amenities (coffeemaker, dishes, etc. ), a hairdryer and iron, and full television / cable and internet service. I had to work from the home for two days and the internet service was quick and reliable. The land surrounding the home is plentiful and well taken care of, and our dog (yes, this is a pet-friendly home) absolutely loved being able to run around and play! It was so relaxing to be able to sit outside in the cool late-August weather and read the paper, take in the fresh air, and relax. The location is perfect - a five minute drive to the center of Edgartown. We took our car for our stay and were able to easily access the entire island. Clif and Judy, the owners, are truly fantastic. They made sure we had everything we needed at the start of our stay, and made sure to ask for suggestions / improvements at the end of our stay (we had none - it was a perfect visit!). They will provide you with everything you need, including incredibly detailed directions to the home (so helpful!) We cannot wait to come back! My small two bedroom home make staying on the vineyard affordable. toilet, combination tub/shower, outdoor shower, Our home has 1 bathroom in the house & an outdoor shower. There is tennis very nearby at public courts. In the summer I join the tennis courts so you can make an appointment to play. The home is a small two bedroom, one bath. Cute and cozy modern cottage. There are queen beds in each bedroom and two sleep couches in the living room. All of our homes have enclosed, private and lighted outdoor showers. Our house located in a private wooded setting within two minutes of Upper Main Street in Edgartown, Massachusetts and Martha's Vineyard's famous bicycle path AND a marked nature preserve that leads down to Sengetacket Pond overlooking Nantucket Sound. It is one and one half miles from Bend In The Road Beach (State Beach, Nantucket Sound) and about three miles from South Beach (Atlantic Ocean). We found the house to be very clean and comfortable. Everything anyone could possibly need could be found in the home along with instructions. We brought along both our well-behaved labs who were also welcome. The groundskeeper called us to ask if we needed additional towels to keep our animals clean. This was very much appreciated as we believe in keeping a well kept home. We did our best to leave the home in the condition we found it. This rental property is highly recommended to people who will maintain a clean home. Lovely spot nestled in natural setting...perfect for our winter holiday getaway! Cliff was very responsive...all communication was prompt! The owners were attentive to my needs. Cute very cozy 2BR home close to town. This was a last minute reservation and this cozy home was just what we needed. 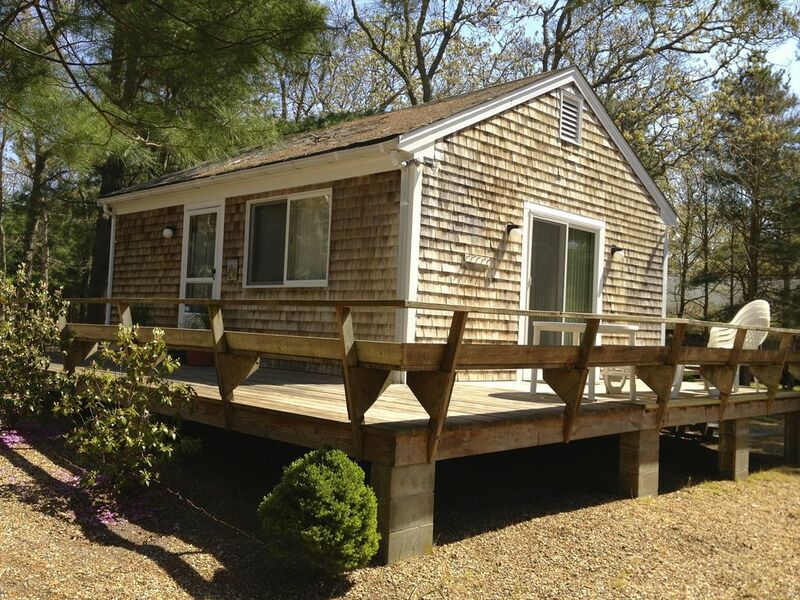 Well kept and great location in Edgartown. Just about a mile or so to grocery’s! Central AC was HUGE being it was 90% humidity all week! It was also bonus that there was a washer/dryer... even though it was in basement and through the exterior of the house. Overall a good stay. Clean, quiet convenient location. Perfect for family or a girlfriend weekend. Owners so easy to work with. Would stay there again. Perfect location and great size for our family of 4. Clean and had everything we needed. Most weekends are 3 night weekends. Sometimes we rent weekends for 2 nights plus anytime check in or anytime checkout rate. This usually happens within one week to 10 days of the rental. But, you must call us first.